I'm new to JMP and are trying to understand the basics of JMP. When trying to create a bar chart, I understand that the underlying data should be normalised in nature (with normalise I mean not summarised/cross tabled). 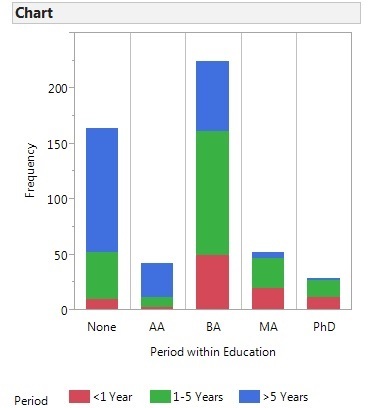 2) My goal is to create the following stacked bar chart (see attached file). Is there a way to normalise the data in JMP? If so, could anyone point me in the right question? If not, can the stack bar chart be created with the original table (non-normalised one)?